Evolution and the Human Mind: Modularity, Language, and Meta-Cognition. Edited by Peter Carruthers and Andrew Chamberlain, 346pp. (Cambridge University Press, 2000). How did our minds evolve? Can evolutionary considerations illuminate the question of the basic architecture of the human mind? These are two of the main questions addressed in Evolution and the Human Mind by a distinguished interdisciplinary team of philosophers, psychologists, anthropologists and archaeologists. The essays focus especially on issues to do with modularity of mind, the evolution and significance of natural language, and the evolution of our capacity for meta-cognition (thought about thought) together with its implications for consciousness. The editors have provided an introduction which lays out the background to the questions addressed in the remaining essays, and a consolidated bibliography which will be a valuable reference resource for all those interested in this area. 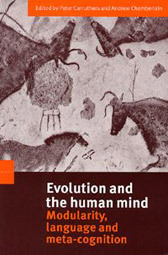 The volume will be of great interest to all researchers and students interested in the evolution and nature of the mind. (from the back cover). Peter Carruthers and Andrew Chamberlain. Introduction. Richard Samuels. Massively modular minds: the evolutionary psychological account of cognitive architecture. Claire Hughes and Robert Plomin. Individual differences in early understanding of mind: genes, nonshared environment and modularity. Dominic Murphy and Stephen Stich. Darwin in the madhouse: evolutionary psychology and the classification of mental disorders. Pascal Boyer. Evolution of a modern mind and the origins of culture: religious concepts as a limiting case. Thomas Wynn. Symmetry and the evolution of the modular linguistic mind. Gloria Origgi and Dan Sperber. Issues in the evolution of human language and communication. David Papineau. The evolution of knowledge. Adam Morton. The evolution of strategic thinking. Robin Dunbar. On the origin of the human mind. Steven Mithen. Handaxes, and their implications for the evolution of language and consciousness. Peter Carruthers. The evolution of consciousness. Jim Hopkins. Evolution. Consciousness and the internality of mind.